This photograph was taking by Jim Dodds from Kelso of Kelso Race Course. Kelso Racecourse has had an early Christmas present with the news that 2015 Grand National hero Many Clouds is expected to appear at the March 5 fixture. 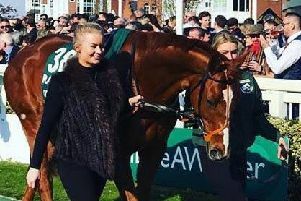 Trained by Oliver Sherwood and owned by Trevor Hemmings, he is being targeted at the £30,000 Totepool Premier Chase (Listed) which is run over 2m 7f. Many Clouds is currently around 16/1 favourite to win at Aintree again in April and Sherwood said: “I want to get two runs into him before Aintree, so it looks like going to back to Cheltenham in January and then Kelso in March. The news comes as preparations are being made for the final meeting of 2015 on Tuesday, December 29 – with the gates opening at 10am and the first race off at 12.05. This holiday meeting attracts a real bumper crowd in the festive period between Christmas and New Year. The feature race of the day is the £10,000 Monteith Memorial, generously sponsored by the Monteith Family and Dennis Coppola, to recall the very happy memories of not only Peter Monteith, the very successful East Lothian trainer, but also his father, Colonel Willie Monteith, who was such a renowned part of racing in Scotland. Sheila Monteith coordinates the family for this annual get-together. A very generous anonymous sponsor is backing the Children’s Immunology Trust, which is having a large fundraising function for this hugely important but underpublicised charity. An unbelievable milestone will be reached at Kelso, with the presentation of the 1,000th bag of carrots by Colin and Ruth McGrath. Carrots have been distributed to all four corners of Great Britain, probably most famously to Nicky Henderson for Long Run, or the year before to Simonsig, owned by Ronnie Bartlett, who produces thousands of tons of carrots of their own per annum. This innovative idea struck a very receptive chord and received huge acclaim by including a prize for the horse that had won the race in addition to the owner and trainer. One of the great characters of racing in the Borders – Gerry McGladery, proprietor of Kilco Ltd – has sponsored the 12.40 race as a memorial to his much-loved father-in-law, Joe Sullivan. Lucinda Russell is aiming Present Flight at this long-distance chase and he showed good attitude to win by 11 lengths at Kelso’s second meeting of the autumn on October 4. A new sponsor to Kelso is SPG Fire & Security Ltd, which sponsors the Handicap Hurdle Race. Company owner Simon Gillie will be on hand to reward the winner. Another new sponsor to the racecourse is G. Marshall Tractors, which has taken on the Novice Hurdle. David Marshall will represent the St Boswells business. The final race on the card is a 2mile 2f Handicap Hurdle at 3.30pm. Alizee De Janeiro has won her last three races at the track for owner Deborah Thomson and Lucinda Russell said this mare is a “real Kelso specialist”. Selkirk trainer Stuart Coltherd is hoping to run Captain Redbeard after his fine third at Haydock on Saturday. In what could be a hot little race, Nicky Richards is also keen to run Parc Des Princes who carries the colours of his daughter and assistant Joey.